Can you believe the holidays are already here? Thanksgiving is less than a week away and the early arrival of guests and those staying throughout the holiday weekend means you may have several meals to serve in addition to Thanksgiving Dinner. The last thing you want to worry about is meal planning the rest of the week, especially if your guests have dietary restrictions. That’s why Trader Joe’s gluten free and pre-made dishes are a great option for a holiday week of healthy stress-free meals! The first trip I ever took to Trader Joe’s was in Union Square in NYC. I had to wait in line to even get inside, but it was a happy line so it made it a great experience, not arduous. I was there with one of my boys and it was full of NYU students. With its reasonable prices and simple packaging, I thought it was a grocery store for college students! A freezer full of easy and healthy holiday crowd pleasers! Well, I was wrong about that. It’s an everyone store! It’s also mostly private label and doesn’t carry the overwhelming amount of product choices you see at the big grocery chains, and I like that. There’s no Skippy peanut butter. No Breyers ice cream. No dozens of brands of packaged items that are all pretty much the same. Without the option overload, I’m constantly trying new things and finding my favorites. I love the butter from France and their applewood bacon. They have good corn tortillas made with 3 ingredients: stone ground corn, water, and a bit of lime. This is great if you’re gluten free and use corn tortillas as an alternative to bread for sandwich wraps! 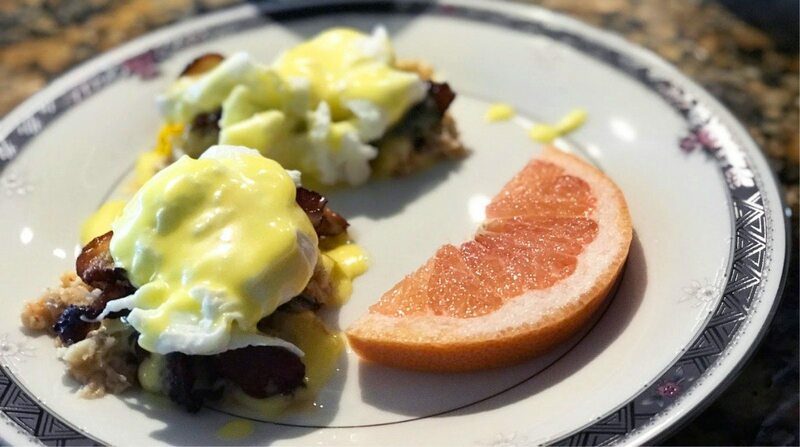 Gluten free Eggs Benny with bacon and crab. Messy… but good! I’m usually pretty fussy about where I buy my meat, but I do like Trader Joe’s all natural chicken. They’ve got some great frozen crowd pleasers like the wild caught lump crab meat and black tiger shrimp. My personal Trader Joe’s gluten free favorite is probably the cauliflower pizza crust. These pizzas work beautifully well, either as an appetizer or meal, loaded with portobello mushrooms, basil, a little sauce and cheese, or whatever toppings the fam wants! Trader Joe’s fresh produce is excellent quality. They have an amazing selection of pre-washed and pre-chopped veggies, making cooking with produce during the holidays a LOT easier. 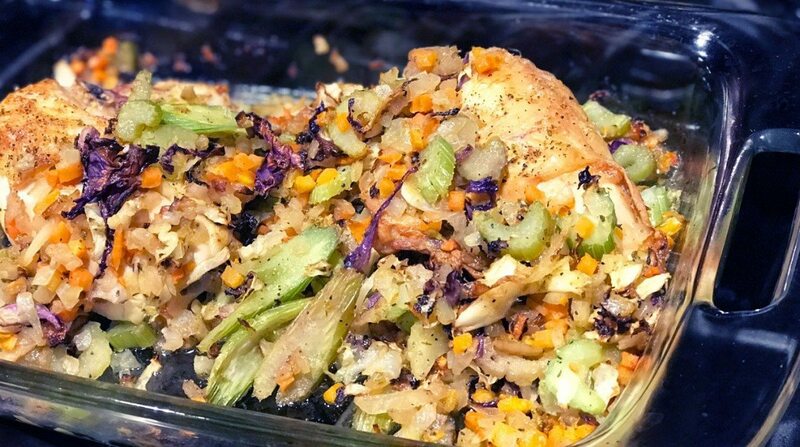 They have individual containers of layered chopped veggies, and I added them to chicken breasts along with some chopped cabbage, and a made a scrumptious chicken dinner enhanced with a little bit of Adobo seasoning sprinkled on top. I cooked it for 45 minutes and it was tender and delicious, and a big hit at our house! 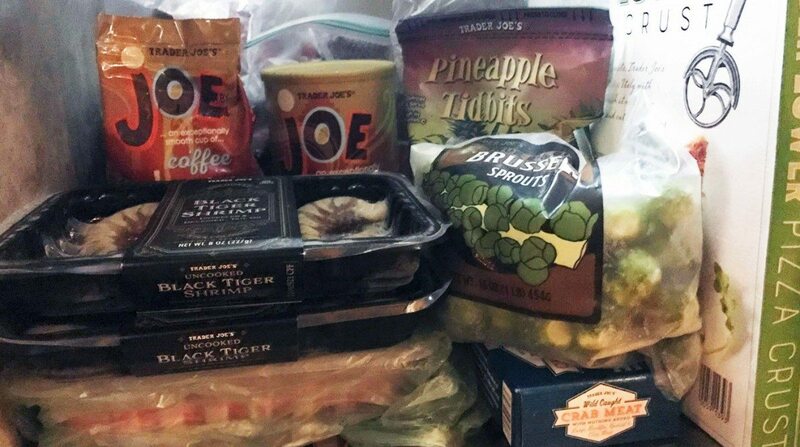 On top of their affordable single ingredient options, Trader Joe’s has a majorly impressive spread of seasonal pre-made dishes, but you have to be careful and read the labels. I love Trader Joe’s, but—like other supermarkets—they also highlight quick-fix, heavily processed foods as opposed to more basic items that one might use to make a healthy meal. I’ve set some serious boundaries to watch what I eat and to not go out to restaurants as much. Plus, I have big Christmas goals so I can fit into that holiday outfit I’m dreamin’ about. Most of all, it’s to feel good when I do indulge in the festivities. No one wants to count holiday calories, but no one wants to go up a jeans size by January either! And speaking of indulging, some of Trader Joe’s best offerings can be found in the wine section. I even found a few of my favorite brands on their pretty shelves. They also offer very reasonably priced box wines, like their Block 67 Cabernet Sauvignon, if you want a nice tasting Cab to bring to a casual gathering or have on hand for those evenings when it doesn’t make sense to open a new bottle. I bought a box and it was surprisingly delicious. Plus I managed to not even remotely feel bad from it, which—I must say—I am grateful for. With celiac disease, trying new things (and cheap wine) without an ingredient list is a practice I avoid in a major way, but I was feeling good and felt confident giving their Cabernet a taste. The box also lasts 45 days in your fridge after the spigot seal has been opened, which is a definite plus! 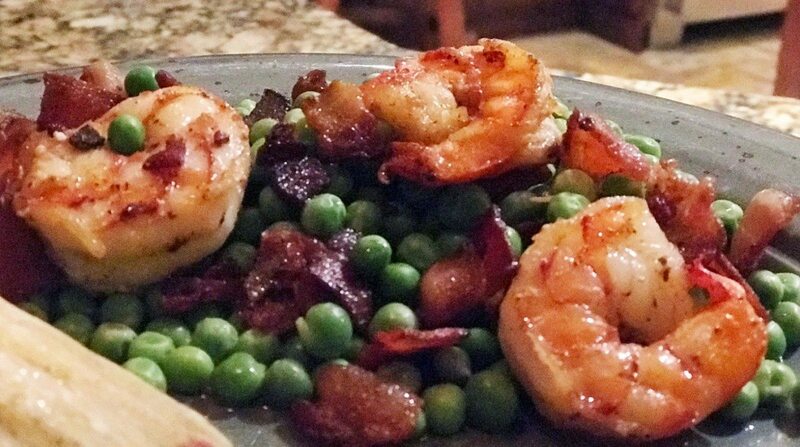 Black Tiger shrimp, applewood bacon and fresh English peas—all from the Traders! Their coffee, frozen edamame and pineapple… are all more of my TJ favorites when you’re short on time or have a full house for the holidays. I don’t eat dairy anymore, but they have a selection of affordable cheeses that rival a gourmet cheese market. Even Trader Joe’s laundry soap smells yummy! I don’t fall in love easily, but when I do it’s the real deal. Now that there’s a Trader Joe’s by my house, I’m in love! Being gluten free during the holiday season doesn’t have to be hard. Yes, eating out will probably always be a hassle, but cooking at home and dining with friends and family can be fun and easy! Especially with a lil’ bit of planning and healthy options right around the corner.